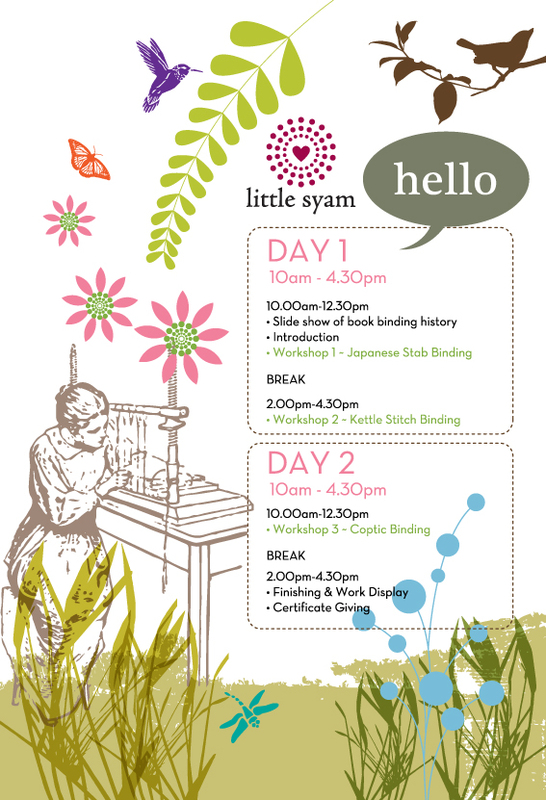 I am proudly announce LittleSyam Book Binding Workshop 3 will be held on 26 & 27 January (Wednesday & Thursday) - weekday workshop. Whereby the weekend workshop (LittleSyam Book Binding Workshop 4) will be held most probably after Chinese New Year 12 & 13 February (venue to be confirmed). For whoever interested kindly book your seat by email me (littlesyam@gmail.com). Let me know which workshop you interested to join. (Lunch will not include this time, only afternoon tea due to logistic issue). Only 10-20 students per workshop and the application will be on first-come, first-served basis. However if the total of student not reach total of 5, I might have to cancel the workshop. HOW MUCH: RM180 ONLY (Incl: afternoon tea, handout, materials & certificate). Material will be provided to all the binding methods... Tools will be on loan for the workshop. You could also bring additional materials such as paper, fabric, thread, string or any decoration like beads, button etc. Extra binding kit are available at minimum price during the workshop. PAYMENT: RM100 deposit direct transfer/cash deposit to Maybank account Samsiah Binti Jendol / ac no: 164052355030. Email or sms me at 012 3666 856, once you've banked-in the money. Balance of RM80 will be paid on workshop day. CANCELLATION POLICY: Full Refund: Minimum 5 days prior to workshop date.No Refund: Cancellation less than 5 days before workshop date.Should class be cancelled due to unforeseen circumstances, fees will be fully refunded.